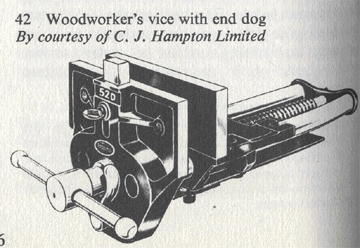 Composed of two jaws, opened and closed by means of a screw, which firmly grip and hold a piece of work in position while it is being filed, sawn, or otherwise operated upon, a vise is used by woodworkers and/or carpenters for both hand- and power tool-work, and by machinists or anyone else who works in metal . 1500 Nottingham Rec. III. 72 Unum vise et diversa files. 1584 Knaresb. Wills (Surtees) I. 145 All my stiddes,..one vice, all my naile tooles and all my hammers. 1677 MOXON Mech. Exerc. i. 5 The wider the two ends of the Spring stand asunder, the wider it throws the Chaps of the Vice open. 1688 R. HOLME Armoury III. 321/2 The Vice, called the Bench Vice,..holdeth all sorts of Iron work that requires Fileing. 1797 Phil. Trans. LXXXVII. 258 In this machine the body to be pulled asunder is held fast by two strong vices. 1827 N. ARNOTT Physics I. 177 It is a screw which draws together the iron jaws of a smith's vice. 1857 DICKENS Dorrit xxiii, A long low workshop, fitted with benches, and vices, and tools, and straps, and wheels. 1884 F. J. BRITTEN Watch & Clockm. 284 For nearly all operations connected with watchmaking either the work or the tool is gripped in the vice. 1866 B. TAYLOR Poems, The Waves, Bound in the vice Of the Arctic ice. 1901 Munsey's Mag. XXIV. 803/1 The doctor's hands, picking at the iron vise at his windpipe, grew feebler. An essential tool, operationally, an accessory on Workbenches. Vises consist of two flat plate-like parts, which -- by tightening a screw -- can be drawn together for securing a workpiece while it is cut or smoothed. ("In American English, the "moral fault is spelled vice, while the clamping tool is spelled vise. In British English, vice is the preferred spelling for both the fault and the tool." Merriam-Webster's Dictionary of English Usage, 1994, p. 940). Vises consist of two flat plate-like parts, which -- by tightening a screw -- can be drawn together for securing a workpiece while it is cut or smoothed.